E-retailers are aware of how quickly customer demographics are changing today. Short-term urgent tasks of lesser importance can easily distract you from your greater objectives. Therefore, it is important to keep track of your progress, and learn what necessary changes are required to grow your business. Propelling your business to glory is a daunting task. You have to identify the key drivers for your business that maximize value, and generate maximum returns. It is imperative for you to keep track of these areas, build upon them, and accordingly, make adjustments every now and then. To help your eCommerce store grow and flourish, we have taken the liberty of explaining the seven most important eCommerce metrics and how to evaluate an ecommerce store. Before orders begin to come in, you need to drive traffic to your online store, and then convert these visitors into customers — this is how things work, but it costs money. CAC reveals how much money you should spend throughout the acquisition process, from promoting a post on social media, to bringing the customer to your site to visit, customer finding a product of choice, all the way through to finally checking out. All your campaigns, paid or unpaid, count as costs per customer, either in terms of money or time. Several factors affect your costs to acquire a customer. To lower the acquisition costs, you should always optimize your marketing campaigns, or try and find outlets that offer effective marketing at lower costs. Remember to consider customer lifetime value. Achieving a maximum conversion rate is every retailer’s dream. Conversion rate is the percentage of visitors on your site who successfully complete a purchase. This percentage is calculated by dividing purchasers over the total number of visitors. A higher conversion rate depends on several factors. Across industries, there’s an average 3% conversion rate, and to improve yours, you must ensure that users are instantly able to find what they want. Through appealing visuals or imagery, and engaging texts, you are more likely to keep users hooked to your site, and thus, increase the probability of a successful conversion. You can also use informative, and creative, videos to highlight your product. A video provides a lot of information in only a little time, and consumers who wish to research a product before purchasing it are able to get a better understanding of the product. Videos are also best for shoppers on mobile devices. The default search function on many ecommerce platforms fails to return the results buyers want. If a shopper does a search and the product doesn’t show up, they will assume you don’t have it – even if you do – and leave. Another issue is searches that return far too many results. 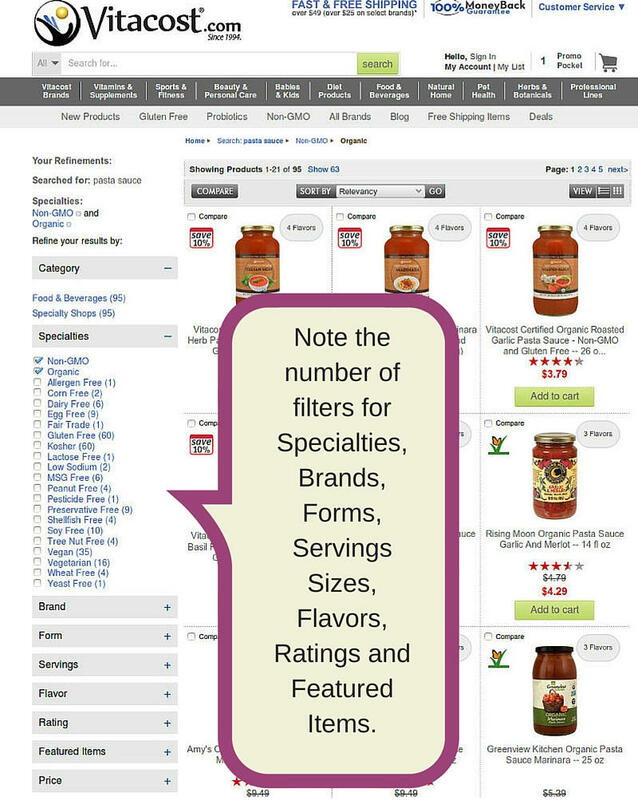 Many default search functions will return every single red product on a site if the shopper searches for red anything. This is totally unacceptable as most will not know what the problem is and just leave when presented with pages of products – none of them what they wanted. There is no excuse for not upgrading your search function. The more search options you offer, the more products a buyer will find and buy. Vitacost.com is a good example because they allow search results to be filtered by many choices including organic, non-gmo, gluten-free, etc. Click image to see the actual page on the Vitacost.com site. Dog food sites are among the worst examples because even though they may allow filtering, none seem to allow price comparison by size of package. Consumers like to sort from lowest plus shipping to highest – and that is useless when the number of pounds is not taken into consideration. Many users disconnect from the purchase process at checkout, because of unnecessary steps, needless pop-up ads, or unwanted redirections. The checkout process should be streamlined, and be as swift as possible. Users expect immediate transactions once they have made up their mind on a product. It is important you provide only relevant information to help users make informed purchases, and must avoid providing or demanding too much information. Distractions can easily put off a potential customer. Higher ‘abandoned cart’ rates are a major disappointment for retailers. If you have a high abandonment rate, ask for user feedback on why they did not complete the process. You can offer discounts, and other promotions, to bring back disappointed customers. Every serious ecommerce site should accept all major credit cards, PayPal, and ensure they permit paying with the PayPal balance rather than requiring a debit or credit card be used. Alternative payment options like FuturePay, Braintree, or Affirm, have emerged as highly convenient facilities for online consumers by offering ‘buy now, purchase later’ services. Integrating such services to your eCommerce store is certain to improve conversion rates. Alternative payment options can also tempt customers to add more items to the shopping cart increasing your average order value because of the flexibility on offer. Average order value is the average amount spent by a customer when placing an order on your site. The higher the AOV, the higher profits you earn per customer. Average order value is the sum of all orders divided by the total number of orders. You can understand this better by analyzing customer browsing/buying history, and average time spent on a product category. This way, you will be in a position to target the interests of the customers better, and show related items to the customer, especially during the checkout process. For example, a customer initially came to purchase a pair of sunglasses from your store, but ultimately selects a wallet to place in their cart. Besides upselling other wallets, you might consider asking if they would like to purchase the sunglasses as well. Alternative payment options can also tempt customers to add more items to the shopping cart because of the flexibility on offer. Recurring customers act as the coal and ice for any eCommerce store. Getting customers to visit your site again, and make a purchase, are on the top of every retailer’s agenda. RCR is the percentage of customers returning to your site to make a second purchase. The repeat customer rates matters because the higher it is, the more satisfied customers you have. Returning customers add to a ‘loyal’ user base, which eventually adds to the reputation of an eCommerce retailer. RCR can be calculated by dividing new customers received in a given cohort, say August 2015, over the number of visitors who return to make a second purchase within a specified time period (e.g. 60 days). The RCR can be improved by providing better customer service, using targeted emails and loyalty programs to woo potential customers, and presenting lucrative offers to customers when they checkout. Rewards, and discount offers, should be personalized, and must show content related to a person’s interests. This is the total amount of traffic your site receives from all sources, including organic, social, email, referral, or direct. The total website traffic determines how many new customers you receive, and how many sales you make. Improving the rate of traffic coming to your website is important as it increases the chances of converting visitors into customers. The rate can be improved by both paid and unpaid methods. Paid campaigns are usually highly refined and targeted. Through paid campaigns, you can boost your venture by purchasing print ads, search ads, keyword ads, display ads, and other types of ads that target potential customers. There’s only one drawback to ‘narrowed’ paid campaigns: you end up displaying your content to very few people and miss out on the opportunity to engage other ‘passing by’ customers who might find your stuff interesting. Unpaid campaigns are highly effective, and you must invest as much as possible in non-paid sources of traffic, such as PR, emails to existing customers, organic social media traffic, organic search results, or content marketing. Moreover, you have to make sure your web development is done in such a way that everything is customizable on your website and gives you control over it. CLV determines the worth of a customer to your business. It is calculated by projecting the expected profit coming from a customers over the entire course of your relationship, and then taking the net present value of those projected revenue flows. The CLV is helpful in explaining customer behavior in a particular campaign, or on a specific page, and also reveals how customer purchase behavior changes over time. Through CLV, you can determine how much – and where – to invest in order to multiply your profits. Customer purchase behavior helps you weigh all of your decisions, from optimizing campaigns to determining when to send your first customer retention email. Encourage customers to return, and purchase often. This is best done through offering promotions, retention marketing, or through loyalty programs. It helps to offer discounts when a customer buys similar items in large numbers. Maintain a balance between your cost to acquire a customer, and the profits you earn per customer. The cost of acquisition should not exceed your profits. If it does, know that it’s time to retrace your steps. It helps to suggest related items to add to their cart before a customer checks out. This increases the Average Order Value, and your profits per customer. One effective way to do this is to display how much more they need to spend to earn free shipping. You must cut down your customer acquisition costs to increase the profits per customer. Invest more in your unpaid traffic driving campaigns, such as SEO, organic, emails, social, etc. Your paid campaigns should be evaluated every now and then to determine how much they are adding to your sales. If they aren’t meeting their target, cut them short, and redirect your investments to a more profitable tactic that has a higher conversion rate. It helps to be aware of all marketing niches as sometimes those being overlooked can drive maximum value. This means 60% of the revenue coming in actually goes to your business and the other 40% goes to cover the goods you are selling. Last, but not the least, gross margin is one area which is more than often overlooked by eCommerce industries. Remember, the lifetime value of customers is based only on revenue. Now, minus the cost of your goods, what percent of the total value do you take home? Let’s say, a product costs $100, and it takes about $30 to get it off the shelf. So, 100-30=70, then 70/100=0.7, which means that your gross margin is 70%. This means that 70% of the revenue which is flowing in, is actually going to your business, and you retain only 30% of the total sales revenue. As a final word, no eCommerce big shot takes actions without evaluating their performance, and neither should you. Once you begin analyzing your data, and measuring your eCommerce store’s performance to weigh your decisions and build strategies, you will be firmly treading on the path to enterprise success. Focus on your metrics, revamp your strategy whenever and wherever required, and utilize both your money and time to the maximum in order to jack up your business to success. Ashar Samdani is a marketer by profession but a product and technology enthusiast by heart. He is passionate about building products and helping businesses leverage technology to simplify complex processes. Highly focused towards customer success, he has guided multiple start-ups & companies on product development & execution strategies. He heads the marketing at TkXel, a web development and mobile development app company. He loves making new professional acquaintances. Reach out if you want to talk marketing, technology, business or boxing. He can be contacted at ashar [at] tkxel [dot] com. Awesome article – just the essentials. I believe less is more. Business owners often look at too many numbers and miss the big picture. My team and I also released an ebook on just 8 ecommerce metrics (https://get.metrilo.com/ecommerce-metrics-guide/)because they’re enough to measure business performance. Plus, it comes with 2 cheat sheets – one for Marketing Health check and another for calculating time between orders. Hope you guys like it! Do you have a writer on staff who can provide a guest post about Metrilo that explains what it does, how much it costs, and offers your ecommerce metrics ebook? Hi, Gail! We sure do! We have other resources on metrics and analytics to help your readers. Can we switch to email for details? Each and every point explained very well. But I have a doubt on your 5th point actually initially we are generating traffic only by non paid methods. But after increasing competition we are working with ads. How we can separate and analyze our two type traffic source. If you are using Google Analytics it may identify where traffic originates. I say “may” because they are providing less and less information over time. Most analytics programs will try to show the source of your traffic. I’ve come to know that the cost of acquiring a new customer is actually higher than the cost of getting a repeat purchase by an existing customer through cross-selling and the likes. Being an entrepreneur is not an easy task as it involves wearing many hats at same time even if you are not directly involved in executing those tasks, you still want to have a bit of information as every area of your business is doing. Thanks for sharing thius indepth post, it was well worth the time. Dan Ewah would love you to read ..Should I just blog on Facebook? Awesome post! It is important that you measure that results of your efforts in running your ecommerce site or business. It is great to pay for paid campaigns but are not permanent for any kind of traffic. Yes, that is true. When I did AdWords management I felt that I could generate more sales than organic SEO could. But that became more difficult over time and it does require continually paying. Thanks for this thoughtful insights. Very informative post as usual. 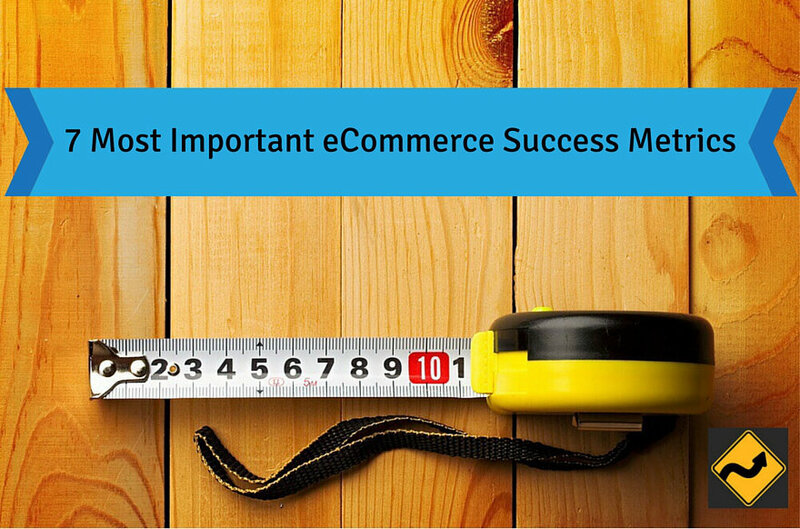 Great points to remember about eCommerce Success Metrics. According to me, traffic is the main factor which governs the success of a e-commerce site. Once people are through the door, it is just a matter of having good products and a well organized site. Once you have the traffic, i think it becomes very important to not only get customers, but also retain them, in other words, turn them into loyal customers. This helps in not only increasing revenue from them, but also, through word of mouth, promotion which will lead to increased sales, and ultimately better profits. I loved going through this article. It’s very informative and unusual from what I have read before. The 6th point is so true. There are many sites that concentrate on bringing customers to their website but a few ones which make efforts to bring them back too. The immense thing about e-business is that as clients begin returning, you’re offering increments and your expense, normally, stays low. This is the reason its truly vital to begin motivating clients to purchase more and continue purchasing i.e. concentrate on up offer, cross offer and rehash deals.